Recipes, recipe requests and what to do with all that lovely home grown food! This topic contains 4 replies, has 4 voices, and was last updated by VegVamp 8 months ago. I was surprised to read this article. Spuds are a big part of a garden clicker’s life! Found this very interesting, Jane, because I have not stopped eating potatoes. Don’t know how much decline in their use is fear of carbs. It may just be a lot quicker to blast a packet of pre-cooked rice in the microwave than it is to prepare and cook potatoes. Will be trying out a couple of these – don’t think you can beat a good potato. I also don’t give them my hens lovely eggs anymore as they only eat the whites WHAT A WASTE!!!! Honestly, it’s just eating too many chips that people should be wary of – there are definitely too many food fads! 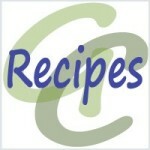 What a great link, with some smashing recipes thanks Jane, I have bookmarked as well. We love our spuds, no chance of them going out of fashion here. Faddy eaters indeed Jane Lot of nonsense.